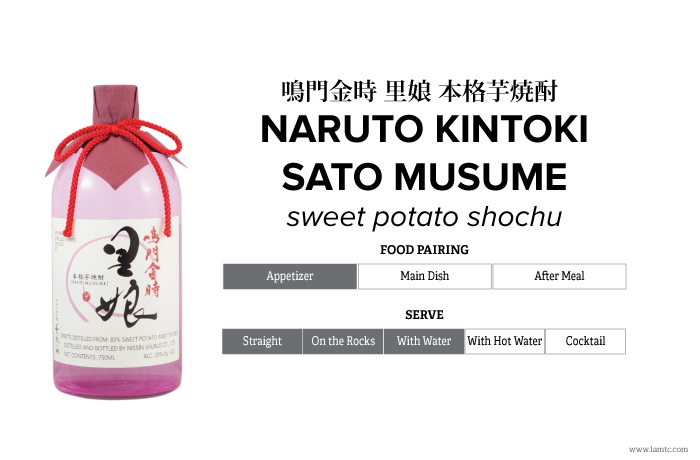 Genuine shochu, handcrafted through a traditional process using the highest brand of Naruto Kintoki sweet potatoes –Sato Musume. By using such divine sweet potato grown in the temperate climate and mineral-rich sandy seaside soil of Tokushima, produced a fine product with a distinctive fragrance and natural subtle sweetness of the potato. Extra mild, rounded mouthfeel with a delicious long lasting aftertaste that pairs well traditional Japanese cuisines or even with dishes such as pizza or spaghetti.